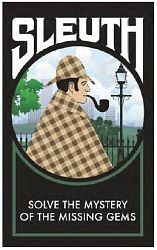 Sleuth is the classic game of deduction by Sid Sackson. PLayers call upon their powers of deduction and logic to discover the identity of the missing gem. Could it be the pearl cluster ? The blue Opal ? The diamond solitaire ? Through strategic questioning each player gathers his bits of information, then skillfully welds them together and formulates the clues which will provide the solution to the mystery. Clever questioning, skillful deductions - combined with some plain old-fashioned luck - make Sleuth and all-time classic game!